Senator Obama opposed naming Iran's Revolutionary Guard Corps a terror group even while it was closely involved in organizing attacks against American soldiers in Iraq. Then, as part of his dirty deal with Iran, he secretly sent a fortune in foreign cash on airplanes linked to the IRGC. And, as another part of the secret ransom deal with Iran, he lifted UN sanctions on Bank Sepah. The United States has gone after plenty of banks for aiding terror finance, but Bank Sepah is somewhat unique in that it is a financial institution actually owned and operated by Islamic terrorists. Bank Sepah is an IRGC bank. The IRGC, despite Obama’s denials, is an Islamic terror group with American blood on its hands. It is to Shiite Islam what ISIS is to Sunni Islam. And even the Democrats know it. After the Khobar Towers bombing, which killed 19 Americans, President Clinton sent a message to the leader of Iran warning that the United States had evidence of IRGC involvement in the attack. More recently, Secretary of State John Kerry admitted that the IRGC have been “labeled as terrorists” when discussing how the Shiite terror organization will benefit from Obama’s sanctions relief. Bank Sepah however had been sanctioned for something bigger than terrorism. The scale of bombings it was involved in could make the Khobar Towers attack seem minor. Sepah had been sanctioned for being "involved in nuclear or ballistic missile activities." Among other activities, it had helped Iran buy ballistic missile technology from North Korea. Iran’s nuclear weapons program would only be halfway complete if it gets the bomb. It also needs missiles to be able to strike Israel, Europe and eventually America. That’s where North Korea and Bank Sepah come in. Bank Sepah helps keep Iran’s ballistic missile industry viable. By delisting it, Obama aided Iran’s ballistic missile program just as he had earlier aided its nuclear program. 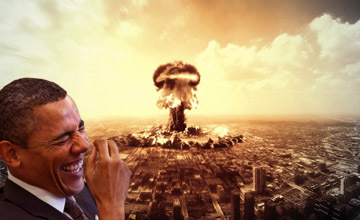 Obama’s holistic approach to the Iranian bomb is to help the terror state assemble the physical components it needs to become a nuclear power. And the truth is hidden within the secret deals. There are secret deals that Obama made with Iran that we already know about. There are secret deals that we suspect exist. And there are secret deals whose existence we are not even aware of. That’s funny because last year he was still claiming that under his deal in 13 years Iran’s breakout time will, “have shrunk almost down to zero.” If every pathway to a nuclear weapon is closed, how could Iran possibly have zero breakout time to make the occasion of the bar mitzvah of his dirty nuclear deal? And which Obama do you believe? Try neither. The secret document revealed earlier this year by the AP showed that Iran would be able to get its uranium enrichment in gear after 11 years and more than double its enrichment rate. What happens by the thirteenth year? Then Iran gets a blank check on centrifuges. That’s what Obama really meant. Then breakout time to the bomb drops from a year to six months. Or even less. Until it hits zero. But Ernest Moniz, Obama’s sniveling Secretary of Energy, assured the AP that it wouldn’t be a problem because Iran would only be allowed to store 300 kilograms of low-enriched uranium. Even as Obama was assuring the Rabbis of how thoroughly Iran was complying with his deal, new revelations were emerging of how he had helped Iran fake its compliance with the deal. That’s the sort of thing you go to hell for. But it’s a little too late for Obama to worry about that. The issue was simple. Obama wanted to lift sanctions on Iran. But Iran was not in compliance with even his mostly worthless agreement. So Obama decided that it was time to help the terror state fake it. Iran was only allowed to keep 300 kilograms of low-enriched uranium. Obama agreed to upgrade that amount to “unknown quantities”. How much is an “unknown quantity”? Like the rest of Iran’s nuclear program, we don’t know. Low-enriched uranium, even in unknown quantities, doesn’t sound that scary. Except that according to a former U.N. weapons inspector, it can be used to produce highly enriched uranium. And that’s how you go from zero to a mushroom cloud over your city. And then there are the large hot cells that Iran was allowed to keep running. Secretary of Energy Moniz didn’t just lie to the AP. Lying to the media is practically an Obama indoor sport. He told the same lie in his testimony to the Senate Foreign Affairs Committee. Senators were assured that Iran would be allowed to keep "only 300 kilograms of low (3.67 percent) enriched uranium hexafluoride, and will not exceed this level for fifteen years." Iran didn’t have to wait 15 years to exceed that amount. Or even 15 minutes. Obama gave them a pass on it right out of the gate. But Moniz wasn’t a rogue liar. He was telling the lie that he had been told to tell. At the Rosh Hashana conference call with the Rabbis, Obama repeated the false claim that Iran had “shipped out 98 percent of its enriched uranium”. He told the lie even though the truth had already come out at the beginning of September. The 98 percent or 300 kilogram limit had been bypassed by him. No one challenged him or called him out on his lie. And that is the problem. Obama has lied about the Iran deal from the very beginning. And that’s not about to change. The fairy godmother of Iran’s enrichment was Hillary Clinton. The “breakthrough” in the negotiations took place when she accepted some Iranian nuclear enrichment. And then it was just a matter of determining how much enrichment would take place officially and how much would take place unofficially that would be officially ignored or covered up by our own government. That is how we got to the ticking atomic time bomb. Obama hasn’t just turned a blind eye to Iran’s race to the bomb. He has empowered and enabled all elements of it from its nuclear program to its ballistic missile program. He has ensured that Iran would have the money, the manpower and the resources to become a nuclear power. He directed elements of our intelligence services and military to prevent Israel from striking Iran’s nuclear program. He even aided its core terrorist organization and its ballistic missile program. This isn’t an error. It’s not cowardice. It’s treason. A coldly calculated plan to turn Iran into a nuclear power is coming together. On the other end of it lies the horrifying death of millions. Why would Obama and Hillary do such a horrifying thing? The American scientists and spies who helped the Soviet Union get the bomb believed that they were making the world a better place by limiting our ability to use nuclear weapons. Their treason almost led to the end of human life on earth. The Iran deal is the second great wave of nuclear treason of the left. And the full truth is yet to be told.